Taking care of your child’s teeth is so important, and you should start brushing their teeth as soon as those first little baby teeth come through. When you’re brushing toddler teeth how often you brush is important. Make sure that your toddler gets into the habit of expecting their teeth to be brushed twice a day. If your child is reluctant to have their teeth brushed then making it into a game with a tooth-brushing song or story can be a fun idea. They might also like to make a game of brushing the teeth of their dolls or teddies with a toy toothbrush. 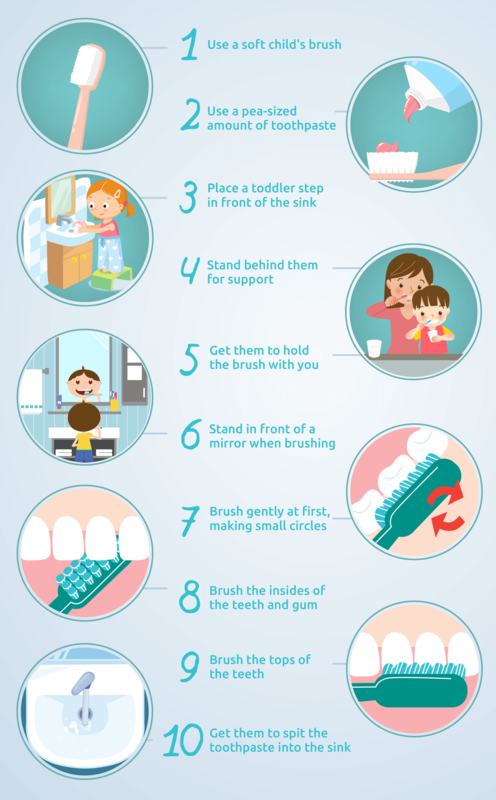 Letting your child see you brushing your own teeth can also help to encourage them. As your child grows older, you need to teach them a good brushing method so that they can get into good habits themselves. Follow our handy infographic to ensure you’re covering all surfaces of the teeth and showing your child the correct method. You should continue to supervise your child’s brushing until they’re at least seven, as even the most brilliant brushers can miss a spot every now and again. Regular trips to the dentist are also essential for good child dental care, so don’t forget to start scheduling those check-ups as soon as your child has teeth! It’s also important to be wary of how much sugar your child is eating or drinking. Avoid sugary treats and drinks (even natural fruit juice contains sugars that can damage teeth), and especially don’t let your child drink fruit juice or squash from a bottle or sippy cup. Use a specific children’s toothpaste and a soft children’s brush. Put a pea-sized amount of toothpaste on the brush. Place a toddler step in front of the sink to bring your child up to the right height. Stand behind them and tilt their head back slightly. 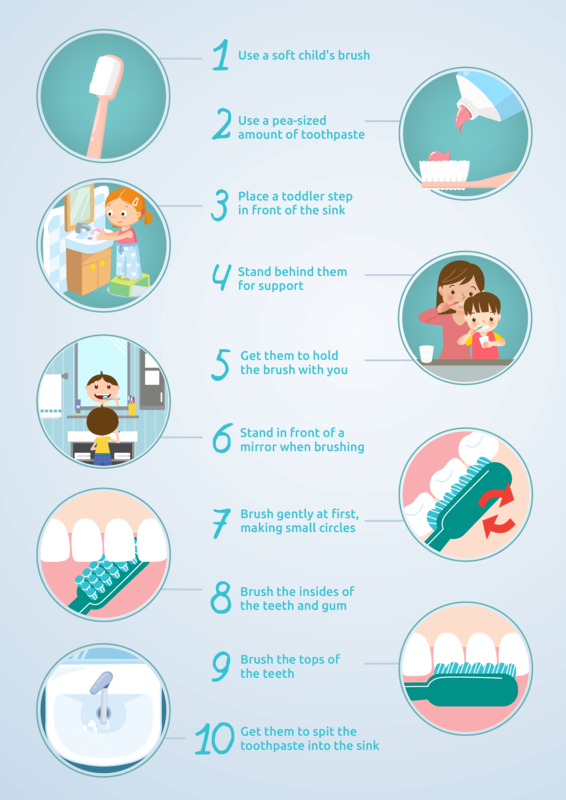 Encourage your child to hold the brush with you to show them the right way to brush their teeth. It can also be useful to stand in front of a mirror when brushing so your child can see what you’re doing. Angle the bristles towards the gum and brush the surface of the teeth gently, making small circles. Brush the insides of the teeth and gums. Brush the tops of the teeth (the chewing surface), using a backwards and forwards motion. Get your child to spit the toothpaste into the sink.